The Paris Overwatch League team now has a name, a logo, and a color scheme, and it’s ready to compete in Overwatch League season 2 when it starts in February 2019. 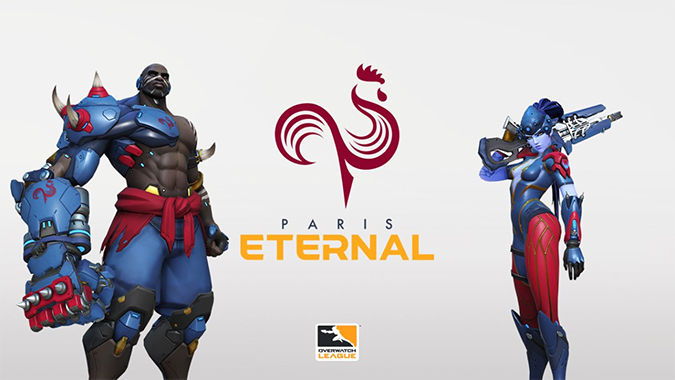 The team will be called Paris Eternal and it will feature a rooster logo with blue, gold, and red accents, the team revealed on its Twitch stream earlier today. It also unveiled what the hero skins they’ll play with will look like, and the ones you’ll be able to purchase at a later date for yourself. Doomfist and Widowmaker both look like they’re wearing riffs on a modern Spider-Man suit with a slight hint of gold. I like the darker blue compared to blues from Dallas Fuel and New York Excelsior. I’m not so sure about the rooster that will no doubt be a tattoo on Widowmaker’s back though. The Paris Eternal roster is pretty packed with notable names, including: Terence “Soon” Tarlier (previously of Los Angeles Valiant), George “Shadowburn” Gushca (previously of Philadelphia Fusion), Karol “Danye” Szcześniak, Nicolas “Nico” Moret, Damien “Hyp” Souville, Harrison “Kruise” Pond, Benjamin “Benbest” Dieulafait, Finnbjörn “Finnsi” Jonasson and Roni “Lhcloudy” Tiihonen. Overwatch League Commissioner Nate Nanzer appeared at the announcement event and promised that Overwatch League games will take place on both Saturday and Sunday and earlier times than usual to fit other time zones. Season two will also feature significantly less game time for its players as well as longer breaks in between stages, which might help reduce the ongoing issues of stress and burnout in the league. Paris Eternal joins eight brand new teams to join the league, including Toronto Defiant, Atlanta Reign, Hangzhou, Washington D.C., Guangzhou, Chengdu, and Vancouver. There’s been a whole series of roster shakeups which should make this upcoming season incredibly interesting to watch, especially with new heroes in the meta like Ashe.